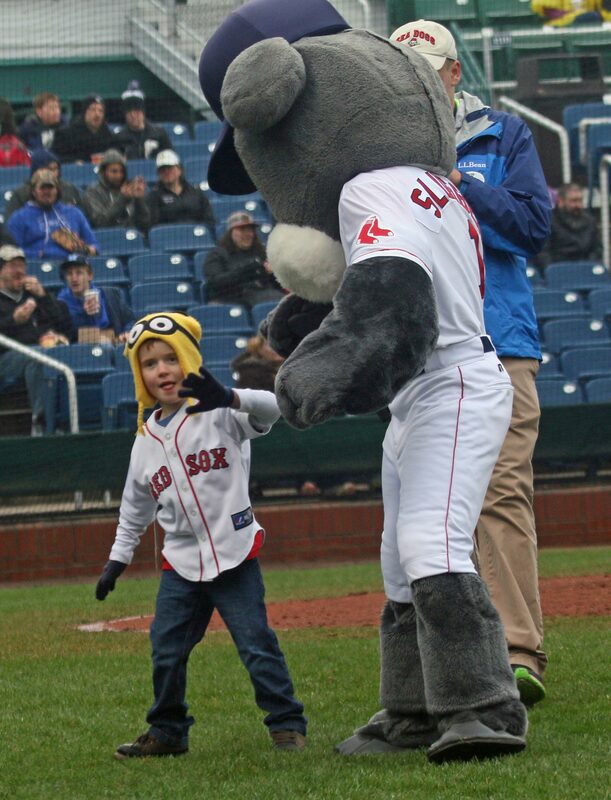 I had my first visit of the season to Hadlock Field in Portland, Maine on Saturday. I hope it won’t be the last. The intended plan was to get a look at the #1 prospects of both the Red Sox and the Yankees. 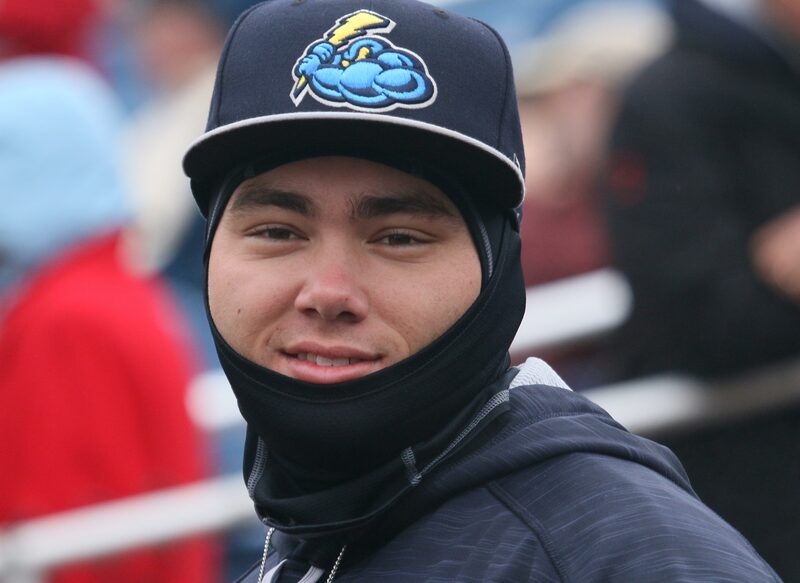 I had checked the Portland schedule and discovered that April 21-23 would have the Trenton Thunder in Maine. You always wonder about what April weather will bring. It was supposed to rain early in the day but then clear off. What I ended being in was 40’s and occasionally misty. The good news? The players weren’t wearing sunglasses. The bad news? 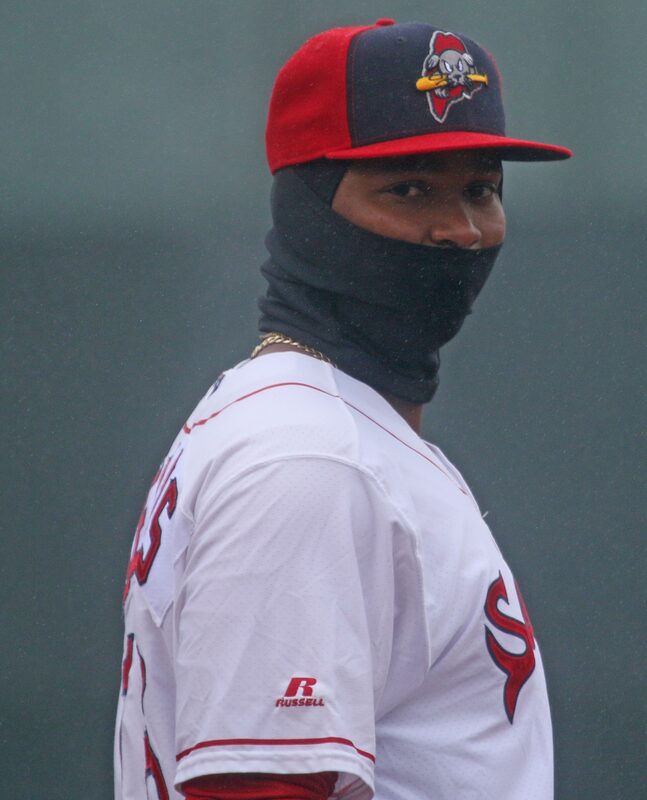 The players covered parts of their faces to protect from the cold. 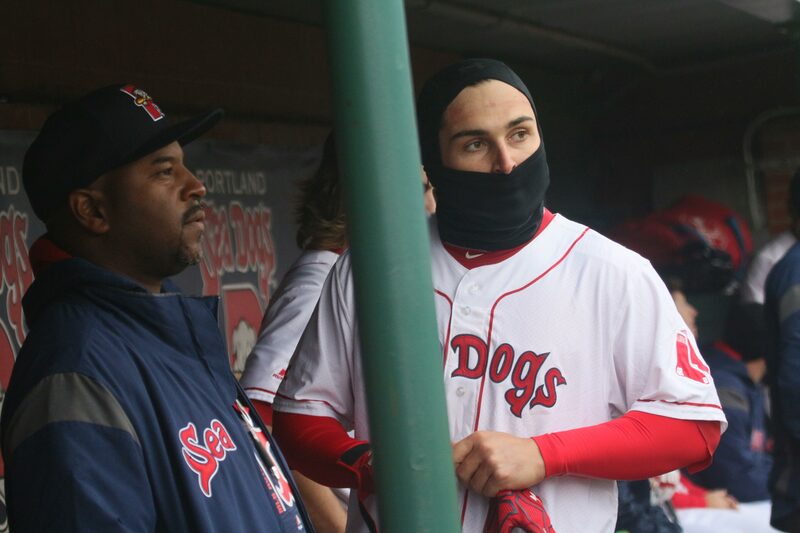 When Mookie Betts briefly came through Portland two years ago my pictures had him wearing what looks like a red ski mask. It can be that cold in Maine in April. 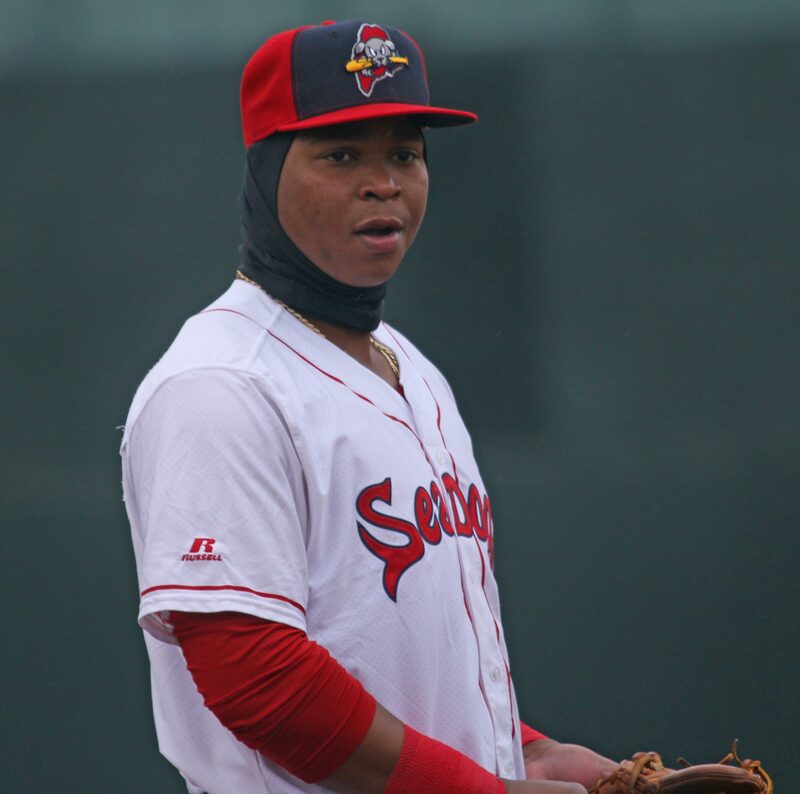 I overheard one of the Trenton players say that he hated to come to Hadlock except in August because it is always too cold. I would agree with that assessment if he had left it to April. May into September can be very pleasant in Maine. I wanted pictures of Rafael Devers (Red Sox) and Gleyber Torres (Yankees). These 20-year-olds are considered the best in each system. Gleyber was a problem because I learned on Thursday night that he was on the 7-day DL. I wondered if he would be traveling with the team. I also did not know what he looked like even if he was with the team. Rafael was a different story: He was active and in the starting lineup. 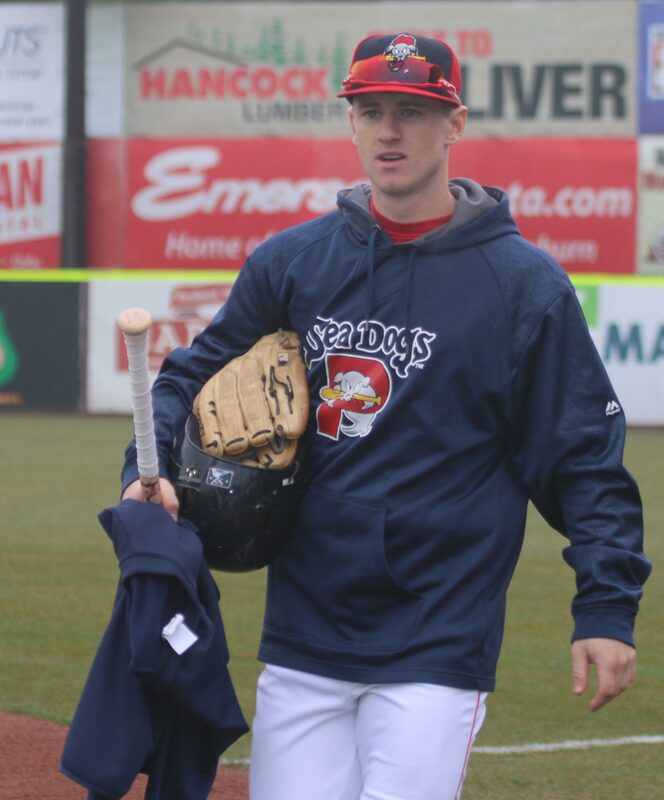 The Sea Dogs also have their names on the back of their uniforms. Trenton had no names on the back and no number on the front. I decided to concentrate my efforts on discerning Gleyber’s whereabouts. I thought I had him spotted in front of the Trenton dugout. Finally realized that I was shooting Dante Bichette. He looked familiar because he looks just like his father the former major leaguer! I was helped in my Gleyber search by Yankee autograph seekers. Several of them were nearby and they started yelling into the Trenton dugout for Gleyber. I heard one of the “yellers” say that Gleyber was sitting in the dugout. Sure enough, it was him. He was out of uniform trying to keep warm. I got several shots of him. Trenton is back in Portland the end of May. Hopefully, Gleyber will not have been promoted to AAA or to the Yankees. Rafael signed autographs so he was out in the Portland dugout area early. I was impressed by the size of him. He is broad and looks strong. I had the chance to get shots of him before game time. Game time changed from 1 to 1:30. The infield was covered and it was misty. Off came the tarp. I think that I could have helped them roll it up if I had moved in quickly enough. 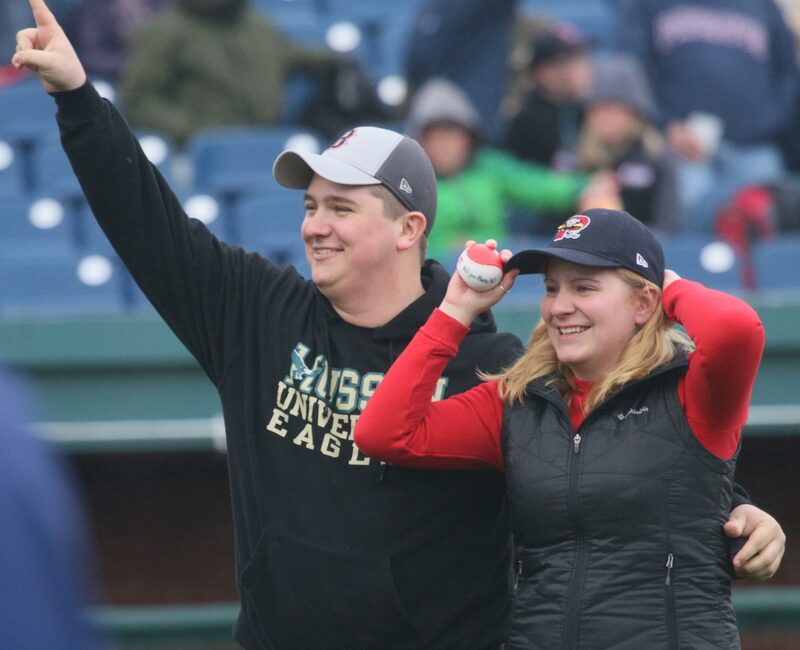 It is a routine at Hadlock to have a collection of folks throw first balls. Within that collection today was a college student (Husson?) and his girlfriend. Unbeknownst to the girl, the guy had written, “Will you marry me?” on the ball that was going to be tossed. When his turn came to throw the ball, he presented it to his girlfriend as he got down on his knee. He asked the Big Question and got a positive response. Whatever works! 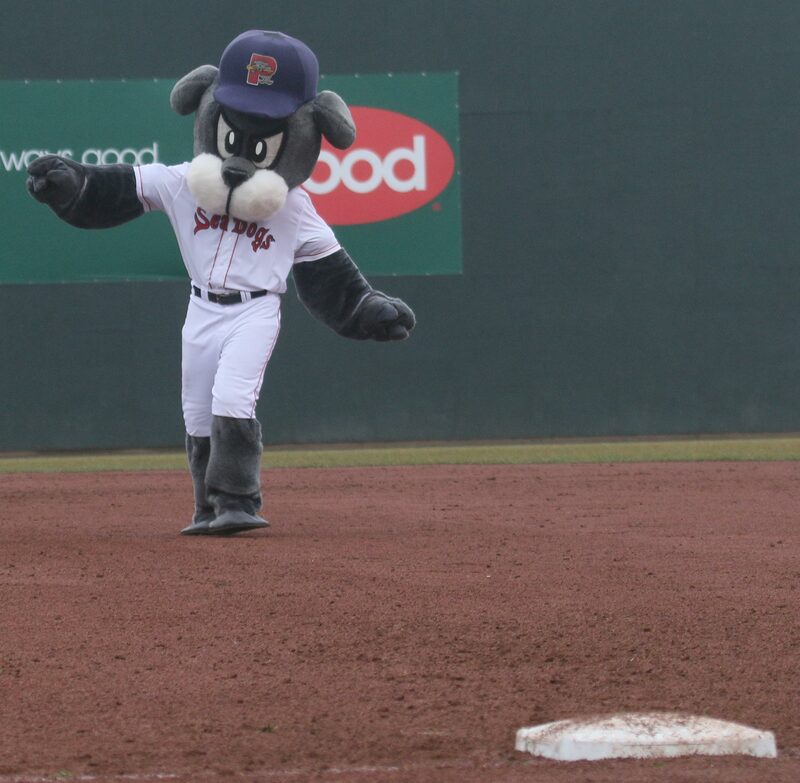 In a 7-inning game (first half of a double-header) the Sea Dogs won 3-0. 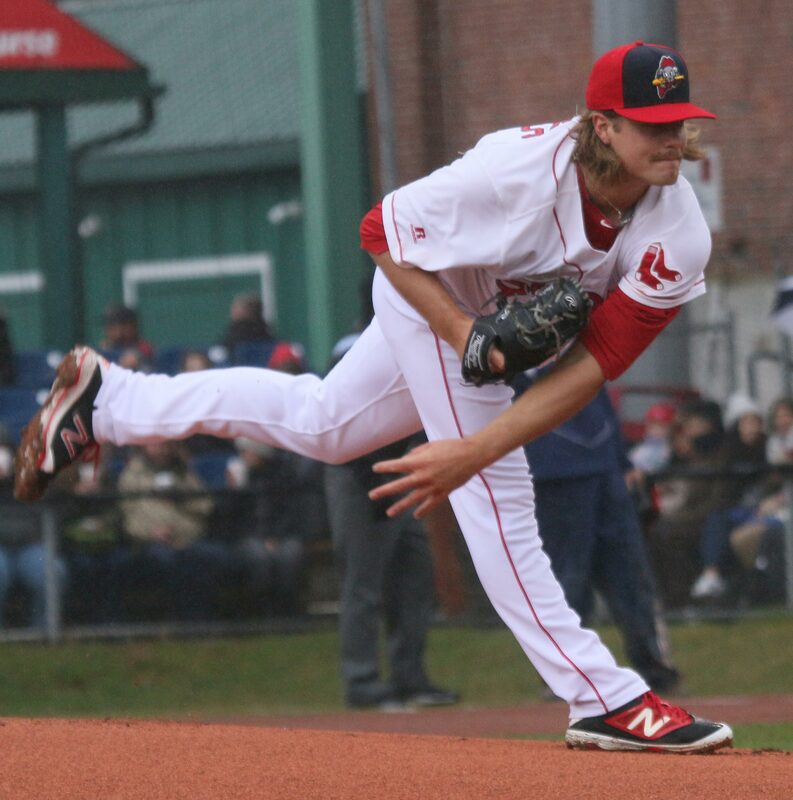 Jalen Beeks, Portland starter, was in serious bases-loaded trouble in first inning but escaped it. The lefty was impressive in his six innings. 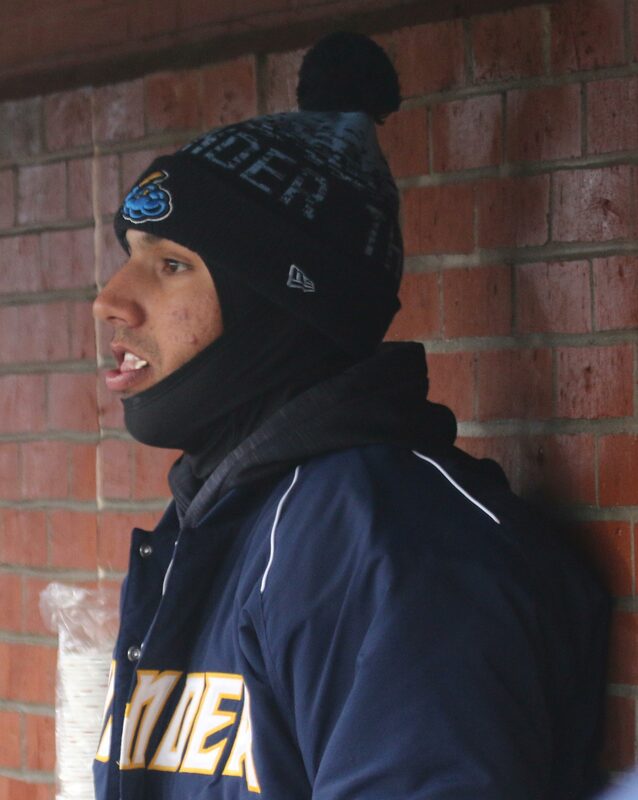 Aneury Tavarez, who is way too good for AA, had two hits and scored the first Portland run. He wouldn’t have scored if the Trenton leftfielder (Billy McKinney) hadn’t bobbled a single that came his way. Boston’s #11 prospect (Nick Longhi) is also with Portland. Nick is a first basemen. 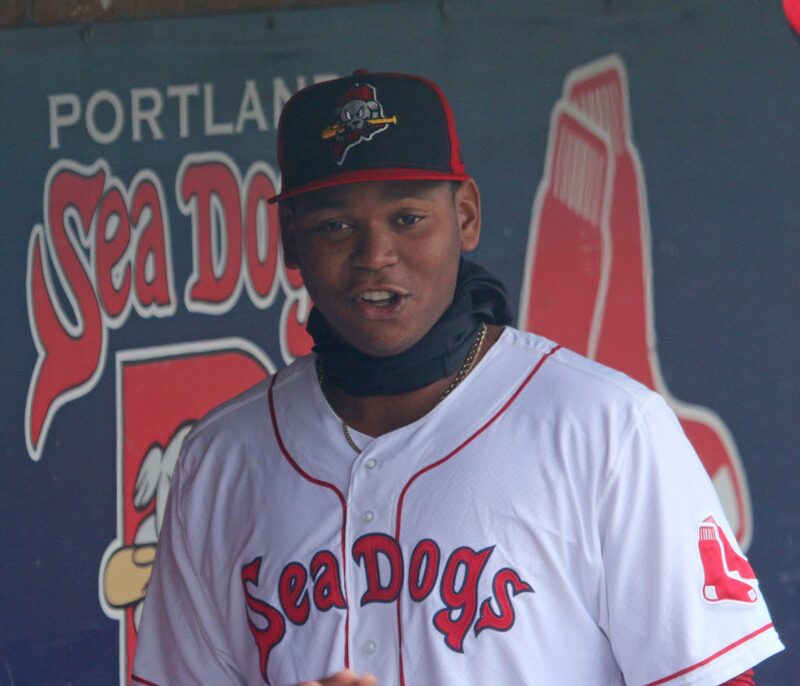 He homered over the Hadlock monster to get Portland’s second run. 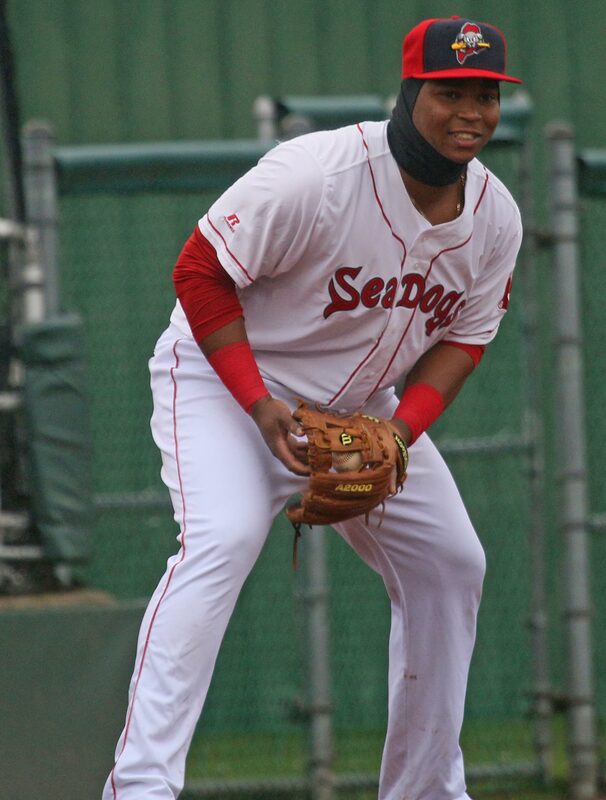 His full face is still a rumor to me but I did get him heavily covered in the Sea Dog’s dugout after the long one. Rafael was very good at 3B. He made a terrific stop on a ball to his left. His arm is strong. He was not cheated at the plate. His swing looked long to me but he did make contact. How well the left-handed batter does against lefties may well determine how fast he moves to Pawtucket. I also got my first look at outfielder Danny Mars. 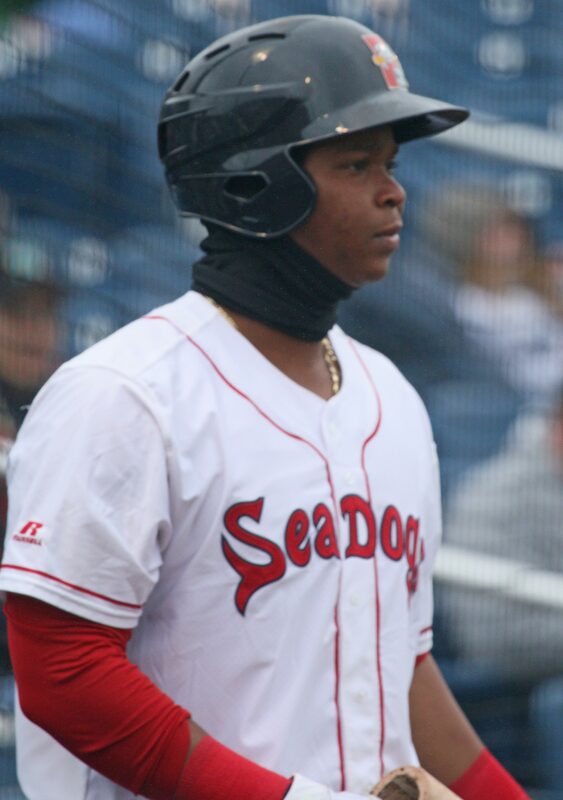 It is extremely hard to imagine a bright future for an outfielder in the Red Sox farm system with youngsters Bradley, Betts, and Benintendi already at Fenway. Danny looks like a pretty good hitter. Injuries happen. Trades happen. We’ll see how Danny’s future plays out. I did not see Prospect 7 (Justin Sheffield) or Prospect 8 (Chance Adams) as both are Yankee pitchers. With numbers on the front of their uniforms, I would have a chance when they came from the clubhouse. Minus the numbers, I’m in trouble, unless they’re starters. Maybe in May? 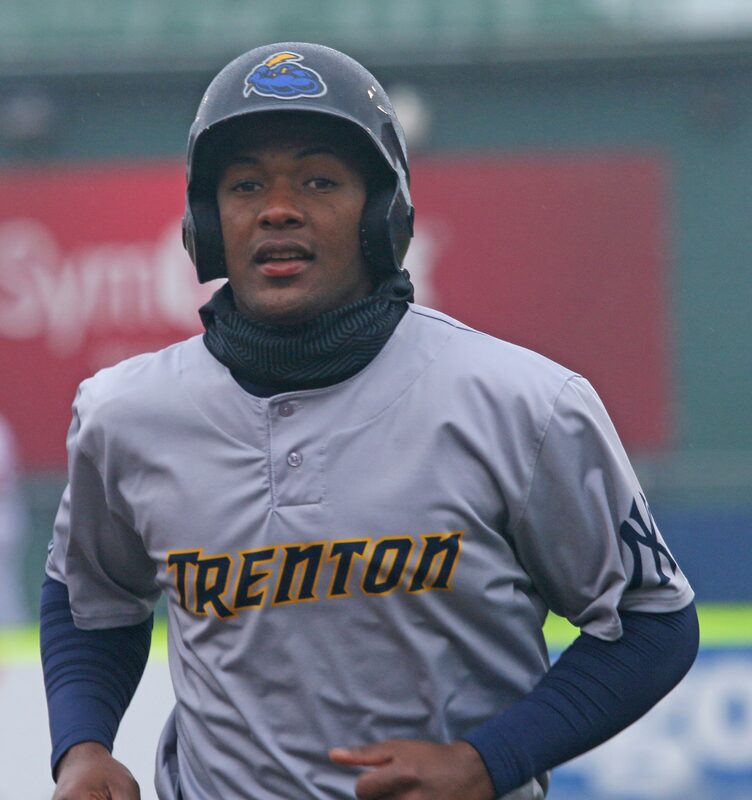 I did see Miguel Andujar (#10 Yankee prospect) again. He was playing shortstop last year but with Gleyber Torres on the team he has switched to third. The 22-year-old will make the majors in time. I may be the only one who looks forward to it but the Slugger race is big to me. I want the big guy to win. I want that losing streak ended and I want to see it when it happens. I wish I could coach Slugger. Today he rounded second, his opponent was going in the opposite direction, with a nice lead. Stay the course and grab the W would have been my coaching encouragement. But not today. Slugger felt a breeze (It was a windy day) and raised his arms and got blown off course. While he’s trying to re-navigate his course, his chance for a victory dissolves. His opponent had another gear from third to home and won handily. 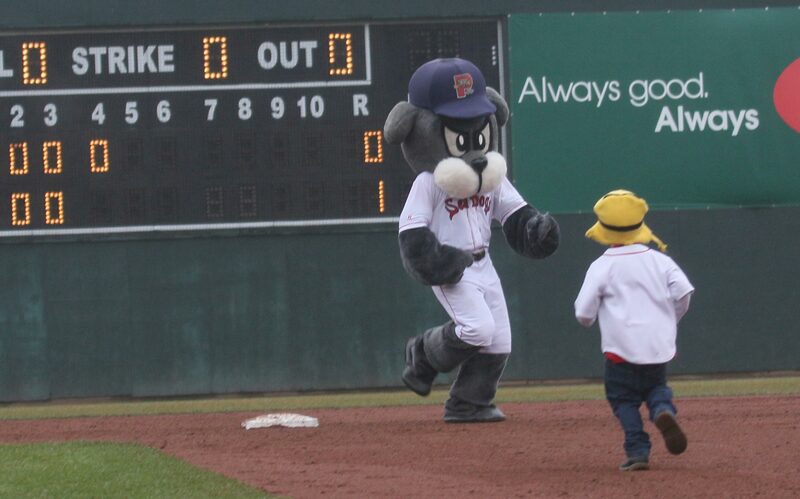 Slugger, even in defeat, tried to be friendly afterwards but the young winner did not appear to reciprocate. I enjoyed the visit and thank Chris Cameron for arranging it. There is good baseball at affordable prices at Hadlock Field in Portland.